Driving Miss Daisy offers valuable assistance & accompaniment services to help seniors and those in need get out of the house. We’ll help them get ready, accompany them where they need to go, remember important information, stay until they are ready to leave, and take them back home. Once home, we like to stay until they are settled back in and comfortable again. Accompaniment and assistance to and from appointments. Comfort for the elderly needing to get out of the house. 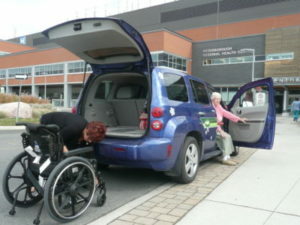 Peace of mind accompaniment service for those with disabilities. Brighten the day with an outing. Driving Miss Daisy specializes in medical appointment assistance and accompaniment. We will safely take them to and from their appointment and liaise accordingly with a family member. Professional services appointments (lawyers, tax preparation, financial/estate planners). We can assist you with documents, questions and follow-up. Grocery shopping: If you have a list, we can do the shopping for you or with you and provide assistance with putting them away.